Simple and powerful workflow software with rich 3D look workflow shapes, including department shapes, workflow steps and workflow objects. Predefined shapes help you make workflows faster. Edraw is an easy workflow diagramming software with rich examples and libraries. It's easy to draw workflow diagrams with the simple drag-and-drop functionality. The following are some 3D look workflow shapes. 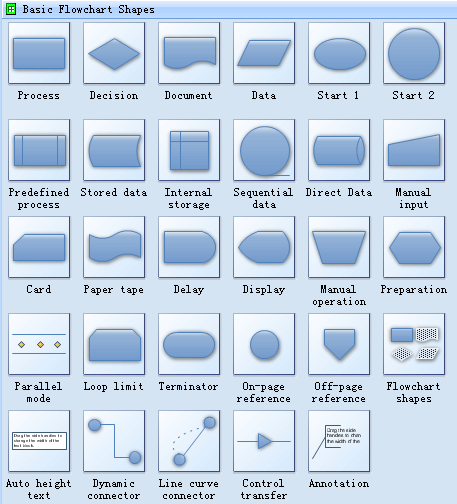 Workflow use special department shapes to represent different types of actions or steps in a workflow. Lines and arrows show the sequence of the steps, and the relationships among them. 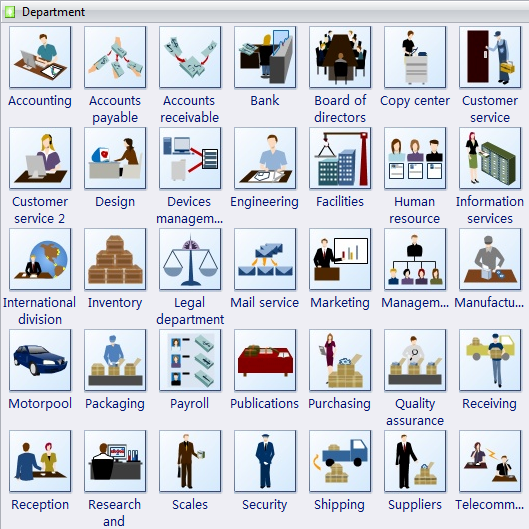 The following department workflow shapes include accounting shape, bank shape, directors shape, customer service shapes, human resource shape, purchasing shape, engineering shape and more. Accounting is the process or work of keeping financial accounts. Accounts payable is money owed by a business to its suppliers shown as a liability on a company's balance sheet. Accounts receivable is a legally enforceable claim for payment from a business to its customer/clients for goods supplied and/or services rendered in execution of the customer's order. Human resource is the personnel of a business or organization, regarded as a significant asset in terms of skills and abilities. Shipping is the transport of goods by sea or some other means. 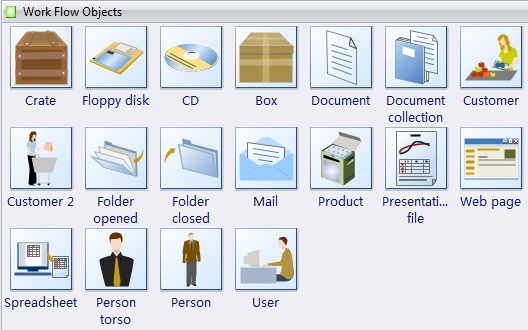 The following workflow objects shapes include the crate shape, CD shape, box shape, document shape, customer shape, mail shape, product and user shape. Crate is a slatted wooden case used for transporting goods. Floppy disk, referred to as a floppy or floppy disk, was originally created in 1967 by IBM to help have an alternative to buying hard drives that were extremely expensive at the time and were not thought of as something to be used with a standard computer. Spreadsheet is an electronic document in which data is arranged in the rows and columns of a grid and can be manipulated and used in calculations. The following workflow shapes represent the workflow steps such as commit, lecture, analyze, problem, phone, meeting, agree, accept, refuse and receive. Lecture refers to delivering an educational lecture or lectures. To draw a workflow diagram, the basic flowchart shapes are necessary. The shapes include basic flowchart process, decision, document and data.